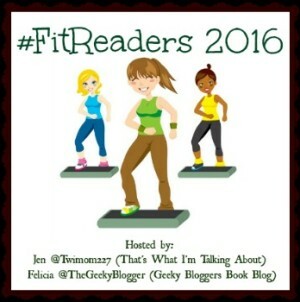 Welcome to #FitReaders!! Felicia the Geeky Blogger and I are super excited to be co-hosting this fitness-oriented group for another year! For the the first quarter of 2016 (January – March), Felicia will be hosting the official check-ins. This is my weekly check-in post where I share about my week, and I hope you share about yours as well. For 2016, Felicia and I will continue to have weekly check-ins at both blogs on Fridays. For the first quarter (January – March), the “official” check-ins will be on Felicia’s blog, but you are welcome to leave messages at either/both blogs, Facebook, or Twitter. We will alternate every other quarter, just like in 2015. Additionally, we are adding a new component to #FitReaders during 2016… The Virtual 5k and 10k Race Series + 1 mile Fun Run! For more information about this fun event, visit the FitReaders info page at Felicia’s blog, and to log in your January “races,” visit the January Virtual Finish Line and post your achievement to the Virtual Finish Line. Each month there will be a virtual ribbon for every finisher, which you can display proudly on your check-ins. If at the end of the year you have completed 10 of the 12 races, you will get an actual medal (see photo) or certificate (1 mile). 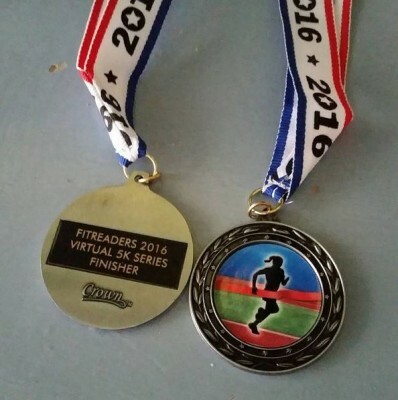 You do NOT have to compete in the Virtual 5k and 10K Race Series to participate in #FitReaders. This is an optional component to the #FitReaders group. I didn’t just decide to go out and walk a 5k one day. It took time and effort to get there. I realize that each of us is in our own place and we all have our own fitness journeys. Some of us have physical limitations that may hamper a 5k (3.1 miles). The purpose of #FitReaders is to support each and everyone of you on your own path. When I started two years ago, I wasn’t exercising at all. I decided to “move with purpose” for 10 minutes each day. That’s how I started, and it went up from there. If you aren’t moving at all right now, you need to start slowly and work your way into more. Find a goal that puts you just outside your comfort level, but is doable. Please note – if you have any physical limitations, consult with your doctor before starting any new exercise routine. I picked ten minutes. Maybe you can only do five minutes, it doesn’t matter, just pick a time amount and stick with it. I either walked outside (very slowly), marched in place, or did a combination of jumping jacks/fake jump roping/high knees, etc. I put a timer on my phone and just kept moving for those ten minutes. My goal was to move every day, but maybe your goal will be 3-4 times per week. The key is: MAKE THE GOAL AND STICK WITH IT. Do this for one month. Then, see if you can increase the time. Small steps. Couch to 5k (C25K) is a program designed to get folks from no exercise to the point where she can run a 5k. The Cool Running website has a great beginner’s program. From their site: “You should ease into your 5K training plan gradually. In fact, the beginners’ program we outline here is less of a running regimen than a walking and jogging program. The idea is to transform you from couch potato to runner, getting you to begin running a 5K or 3.1 miles and on a regular basis in just two months.” You can tailor the program to fit your needs, and they even have an app to help you keep track of the workouts. I’ve never tried the app, but it has good ratings. I like that the program is either distance or time based – you pick what you want to do. And if you aren’t interested in running/jogging, just swap out “jog” for “walk briskly.” Have you done a C25K program before? Share the details in the comment section! The holidays are over and I’m trying to get back into a routine. I did get back to BodyFlow (like yoga) this week and I have been working hard to get out and get extra steps. I only gained 1.4 pounds over the whole holidays and I’ve already taken off 1 pound since Monday. It’s amazing what going back to “normal” eating and exercising can do! I did get in my Virtual 5k this week (more than once), and plan to do a 10k before the month is over! So are you ready to lace up your sneakers? Are you ready to up your commit to fit? Be sure to stop over at Felicia the Geeky Blogger blog starting January 1, 2016 to continue in 2016! Thanks for a great year! Blessing to each of you for a healthy and happy 2016! I had an okay week. I’m still ramping back up to doing more than just walking. I’m pretty sore. Plus I had some real life get in the way yesterday, but all in all, not a bad start back into a full week of work and exercise. I’ve never used C25K, but DH used it and really liked it. It worked really well for him. I know that he used the app as well on his iPhone. I can’t really give more details than that. If anyone has specific questions, let me know and I can ask him. Thanks for the input, Mel. It seems like a great app to try out for newbies! Hope real life gets less messy for you! You did great!! I was so worried I would gain a ton over the holidays, because I ate pretty poorly. I still worked out, but my sweet intake was bad. Thankfully my pants still fit and I already lost the lb I gained. I was actually really happy to get back to my normal dieting routine!! Yea!! Great job. We are all ready to re-commit and get serious! How have the knees been? That’s good! Glad to hear! I have done C25K a few times and I am currently about to start week 4. I used it last year for my St Patrick’s run and had my fastest time to date (32:11). Hoping to beat that at this year’s race. I do use the app and I have also set the timing stops together with music. Awesome – thanks for the feedback, Georgia! I may look into this program from my kiddo. I’ve always wanted to try Bodyflow. Unfortunately, it isn’t offered at my current gym. Sigh…. Oh… I love this class hard. A year ago, I found a gym in my area that offers all the Les Mills classes (I only do BF), and you can pay per class. It’s so reasonable. So I go once per week. That’s great that you can pay per class! My former gym (which I left when they went bankrupt and padlocked the doors shut–although it is now open under new management) offers the classes, but you have to be a member and they are EXPENSIVE! So looking forward to another year with the group. You had an awesome week Jen, well done on getting your 5ks done, I’m working towards a 10k … in winter lol but if not I’ll be doing my best to do the 5k each month. I have the C25K app but didn’t do anything with it last year … maybe this year?? Not sure about running though, one of my achilles is playing up after all the falls I had in Nov/Dec. Thanks! I’m not planning on running much – especially with the cold and icy roads. But I’m going to try to get in a 10k walk. It will take me about 1.5 hours. I’ve done 5 miles, so I think one additional mile is doable – right? Great job this week and thanks for the inspiration! I am curious about the Couch25K program. My sister has done it and she loved the app. She is a lot more fit than I am. I don’t think I should run because I have foot problems but I think walking briskly sounds good. Thanks!! If you try it out, let me know. I think you could totally use it to walk the 5k. Maybe google and see if there is one specifically designed for just walking?